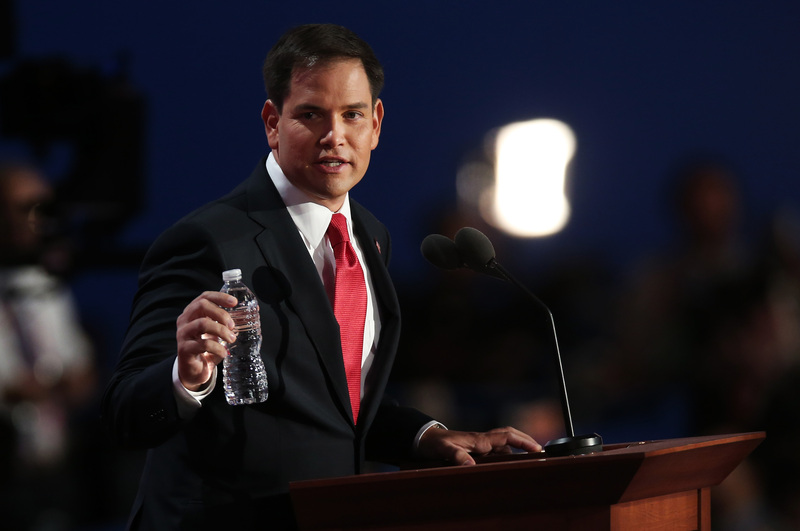 Florida Sen. Marco Rubio torched any chance he had at winning over environmentalists after he made a terrible joke about California's record-breaking drought during his opening comments at the GOP presidential debate on Wednesday. Rubio joked about the California drought in an absurd manner that shows that he has no idea how serious the problem is. The Republican hopeful said that he knew "California has a drought, so that's why I made sure I brought my own water," as he held up ... a plastic water bottle. Just to catch the Senator up on the devastating environmental crisis in California: 386,803 acres of California have been burned by wildfires so far in 2015. Just this past weekend, hundreds of homes were destroyed and three people were killed in a single fire in northern California. In addition to the dangerous fires, which have proven extremely difficult to manage, the drought is so intense that for the month of July, there was a government-mandated 25 percent decrease in water usage across the state. And to the point about Rubio's disposable bottle: Not only are plastic water bottles universally considered terrible for the environment, but drinking water in California is rapidly decreasing. Unlike Marco Rubio, I don't find any of this humorous.